Looking at the SVG it seems that Gapplin is using the width and height attributes of the root SVG tag, but ignores the unit. In the attached file, the document size is stored in mm units. In the screenshot, exactly the same size values are shown, but as px. 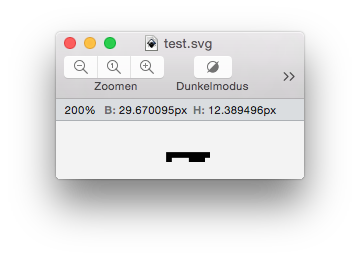 If stored without a unit symbol (thus px, for the test file this corresponds to 105.13026 width and 43.89979 height), the SVG is shown correctly. The SVG renders correctly in Safari. I have the same problem with svg plots generated in R.